Hey, Bandai, Diamond, DC Direct, Mattel, NECA? Pay attention. Until recently, Clint Barton was just another soldier in the service of SHIELD. That was before Nick Fury himself noticed just how dangerous Barton was with his trademark bow, and invited him to be a part of the Avengers. Now he fights alongside the most powerful people on the planet, relying on his wits - and his incredible skill with a bow - to keep him alive. When the trailers and publicity stills for The Avengers started coming out, Hawkeye was displaying all the usual mistakes Hollywood archers tend to make. But what nobody realized at the time was that the trailers were mostly made up of alternate takes, and that very little of what we saw there would be in the finished film. Once the film opened, the results were much better. It's always nice when things work the way they're supposed to, isn't it? By the way, those two articles we just linked to? They're authored by OAFEnet's archery consultant, which gives you an idea of why we're such sticklers for the way a toy archer is supposed to work. Just as with Loki, the facial sculpt on Hawkeye is outstanding. He's wearing his glasses, which are sculpted on, rather than removable, but even without seeing his eyes there is no way to mistake the Jeremy Renner likeness. Either Hasbro has some very talented sculptors on retainer, or Gentle Giant's RealScan technology has come a long way. Hawkeye's costume isn't really a costume: it's more of a tactical assault suit, same as Black Widow wears. The shirt zips up the front and has a the usual modern superhero costume texture, which makes it look like he's wearing a flattened dodgeball. Of course, he gets his clothes manufactured by the government, so it makes more sense for him than it does for Spider-Man. It wasn't this large on the film costume, but it was present. There are ribbed panels on his sides, and his pants have a slight texture to keep them from looking flat. Not that they would, with the sculpted wrinkles, the straps around his thighs, the kneepads and the high, complex boots, but you get the idea. The costume is mostly black, with a little bit of silver for the buckles and zippers. There's a large maroon panel on the chest, with matching colors in the lenses of his glasses and the shooting glove he wears on his left hand. The skintone matches between all his exposed parts, and his arm guards are two different shades of grey. Contrary to what was said in that first Wired article, you can almost be certain that they added the second arm guard just because it did look cool, not because one was insufficient to protect his skin. He has a SHIELD logo on his chest, painted crisply. 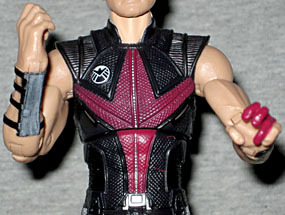 Hawkeye comes with his bow, of course, but no arrows - not even in the included quiver. What's up with that? Maybe this is meant to represent the inevitable part in any long battle where the archer dramatically runs out of arrows? That's all we can figure, because why else would they short-change the toy this way? The bow is a decent approximation of the one he used in the film, but the bowstring is molded plastic. 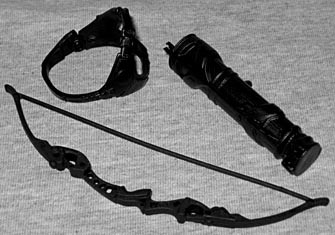 The quiver is detailed nicely, other than the total lack of arrows, and the figure includes a harness that appeared in the concept art, but not in the film. And that would be fine - it adds a little visual flair to the figure - but it's design to make his quiver point the wrong way: it needs to be reachable over his left shoulder, not his right. The harness can be removed, though, and if you put it on upside down, the quiver can be pointed the right way. So, now we come to the part of the evening that can make or break a figure: the articulation. We've spoken many a time about how an archer needs to be able to move, and why all those figures we linked to in the first paragraph were doing things wrong. So, so wrong. Well, Hawkeye? Does things right. So, so right. 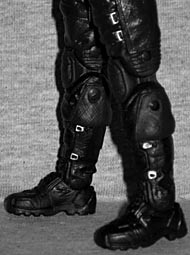 He has all the joints that a figure produced after 2005 should have: swivel/hinge ankles, double-hinged knees, swivel thighs, swivel/hinge hips, swivel/hinge torso, swivel/hinge wrists, double-hinged elbows, swivel thighs, swivel/hinge shoulders and a balljointed head. 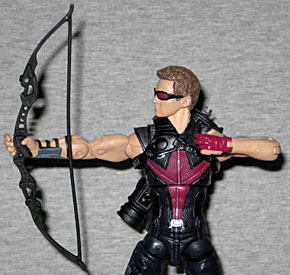 By not halfassing the joints in the arms, Hasbro has allowed Hawkeye to get into a fairly realistic archery pose. He can actually get his hand close enough to his cheek to look like he'd be able to sight along the arrow (if he had one). Is that really so much to ask? No, it's not. So why do companies usually manage to screw it up? The biggest problem is the angle of his fingers, which makes him point his bow down slightly, but a little bit of fiddling around will fix that. 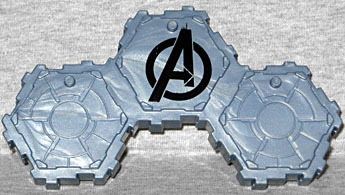 All the Walmart-exclusive 6" Avengers toys come with a "collector's base," a lump of plastic comprising three linked hexagons with ragged edges. The Avengers' "A" logo is printed on the smooth center hex, while the other two have sculpted cracks. If you like this kind of base, it's basically just a repacking of terrain from Hasbro's discontinued Heroscape game. Okay, Heroscape didn't have footpegs on each hex, but there's no mistaking the style. The point we're making is, if you like this base and want to expand, you can probably pick up Heroscape leftovers on the cheap. 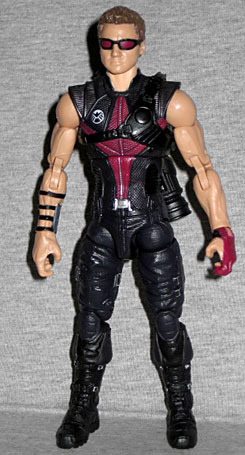 Hawkeye makes for a really good figure - that is to say, Hasbro made a really good Hawkeye figure. The only "flaws" with him have to do with accessories, and none of those are really so terrible. The only tangible drawback is that he's incredibly shortpacked, so you'll have a devil of a time trying to find one. If you stumble upon one at the store, don't hesitate, because you likely won't see him again. 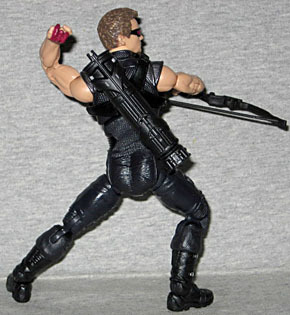 And every other toy company out there, pay attention, because this what an action figure of an archer is supposed to be.